Experience the convenience of completing your online degree program from anywhere you choose. Avoid the hassles of commuting, coordinating your class schedule or leaving a job, and instead focus on earning your degree at a pace that’s right for you. Our world-class professors teach on campus as well as online, and offer instruction from a Christian perspective. They will guide you through your coursework and provide feedback that’s both prompt and helpful to your degree progress. 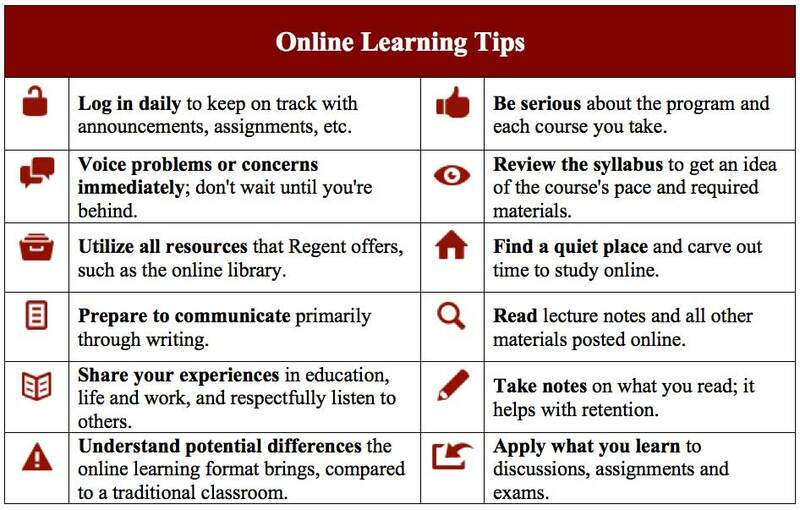 Check out these helpful online learning tips and be sure you have access to and are familiar with the following tools. You should have access to a laptop or desktop computer that meets the minimum requirements recommended by Regent University’s IT department. Regular Internet access is required for the online classroom, checking email and registering/paying for classes. You should also be familiar with using search engines for your research and writing assignments. When you register for classes, Regent will issue you an email account. You should know how to compose and check emails and send/receive attachments. You will also need the capability to download items like PDFs or Microsoft Word documents. Communicating via the written word is especially important for online students. Regent’s virtual classroom, known as Blackboard, allows you to view all of your course materials and grades, participate in discussion forums and submit completed homework assignments, quizzes and exams from anywhere you have Internet access. Some courses or programs may use real-time instruction for lectures, PowerPoint presentations or Q & A sessions with the professor through Blackboard Collaborate. Genisys is a secure site that allows you to register and manage your accounts entirely online. You may pay your tuition, check your grades and transcripts, and update your personal information safely. My Regent Portal is your personalized Regent home page on which you may log in to gain access to Blackboard, Genisys and your Regent email account. Students who do well online are organized, self-motivated and good at managing their time. It is important to complete study sessions and assignments without having to be reminded of deadlines. As a Regent student, you’re connected to an entire community of online learners from a range of backgrounds, cultures and experiences. Not only does this expand and enrich the learning environment, it also enables you to develop friendships and collegial relationships that may last an eternity. Throughout your degree program, you may also participate in free online workshops; take advantage of guest-speaker audio, chapel videos and more; and even seize the opportunity to study abroad or participate in a mission trip with other Regent students.